My brother was in Tokyo a few weeks ago, looked at this robot dog, and noticed the line about it not being sold in Illinois. He mentioned it to me, and I started to probe into why, and stumbled upon next week's Supreme Court case. As I often say in this job, sometimes it's better to be lucky than good. Meet Aibo, Sony’s new robotic dog, introduced in the United States in September. Cute, right? Sits on command. Plays with his cute little pink ball — Aibo loves pink. Scratch his cute round head and he dips it and wags his cute tail, adorably. He has a camera in his nose. Would you like to own Aibo, maybe to liven up your Gold Coast apartment without the bother of taking an actual living dog on unpleasant, windswept walks in the wintertime? Too bad. You can’t have him. And not just because of the price — about $3,000, a night on the town for Chicago’s nouveau rich. Aw, gee. We know Illinois has problems. But are we so screwed up that multinational corporations won’t sell us a dog? 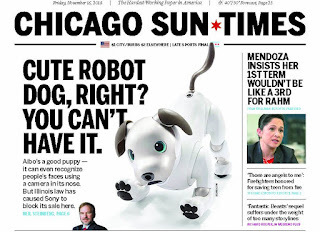 Illinois is the only state in the country where Aibo is not sold. I used to have a laptop with login face-recognition. It didn't work if the lighting in the room was different than it was when you set it up. Frustrating. Being the tech genius that I am, I finally put a piece of tape over the little lens thingy, and went back to logging in with a password. I now have this image of little Aibo dogs, scampering around people's houses with their eyes taped shut. I think you'd have to tape up its nose, not its eyes. The fingerprint recognition is crazy too. Won't work if your finger is the least bit wet. Not sure if it would work if the finger were dead (see Minority Report). Which leads me to say that a good deal of this security is nonsense. About the only thing worth protecting on my phone/computer is my bank account and if I use the same password for that as I do for several other things, all the bad guys have to do is unlock one insignificant door to obtain the key to what really is worth protecting. tate/john, an iPhone can accept multiple fingerprints for login, they can be different people or just different fingers. This has helped me with wet-finger syndrome. For passwords, make three lists of 3-5 letter words, then chose one from each list, put them in an order that makes them easy to remember, but not an actual sentence. Like "dogphotofake", no reasoned search would detect it. Add numbers or symbols if required. You can craft several passwords this way, with the words making sense to you only. Tape would help with AIBO, use it on the shipping box and send it back where it came from. Sorry, Aibo. You’re a cutie, but I don’t need a camera tracking my face at the moment. Legal question, for both lawyers and non-lawyers: If someone in another state...let's say Ohio...were to purchase this product and then shipped it to a resident of Illinois, after the Illinois resident agreed to pay all shipping costs, plus a handling fee, would either the Ohio seller or the Illinois buyer be violating any laws and face any penalties? Say...fines or prison time? Or to play off of that, what if someone from Michigan bought it as a present for someone in Illinois, gave it to them in Michigan, and they brought it home. Are they going to be checking for that? It does seem rather silly. As a lawyer who prides himself on dealing with hypothetical questions in lieu of real world concerns, I would say, "No." Illinois law does not forbid purchasing the toy or selling it for that matter. It's Sony that's laying down its law there and Sony doesn't have any power to fine or jail you for contravening or circumventing its regulations. Go ahead and get your Aibo by any means you want. Though I suspect you'll be disappointed. Feel free to sue me if my advice gets you in trouble. No dog in this fight...nyuk nyuk...I've been a kitty guy for the last four decades. And I'd never buy one of those silly things for myself. Not after growing up with real dogs. I've heard tell that the Japanese love these dogs, as well as toy cats. Do they bark and meow? But now the Japanese have opened "rent-a-pet" places, so you can take a dog for a walk, or maybe to a park. And they have "kitty cafes" where you can interact with live felines, for a fee. Such places are quickly becoming popular in this country, too. You pay a cover charge, buy a cup of coffee, and pay to play. These resident cats are all adoptable, just in case you happen to fall in love with any of them. 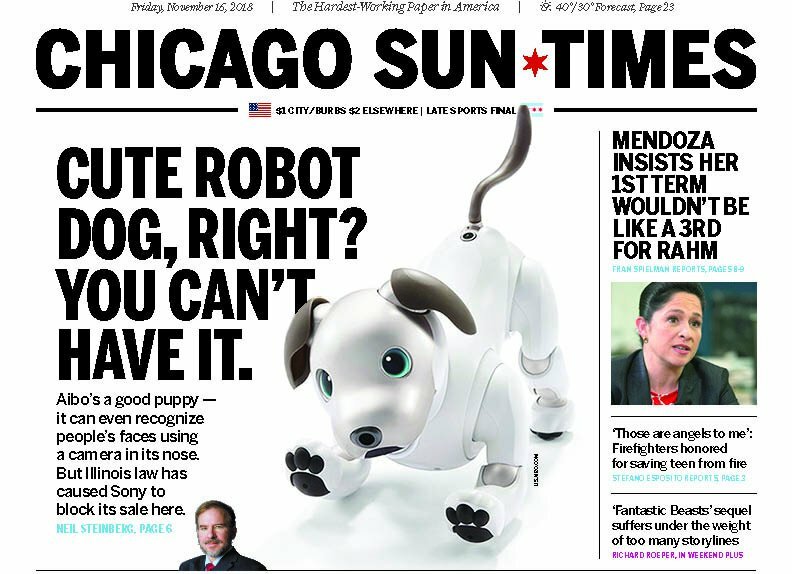 If someone Chicago was desperate enough, and...say...needed an Aibo for Christmas...I could be the original buyer and re-sell it. 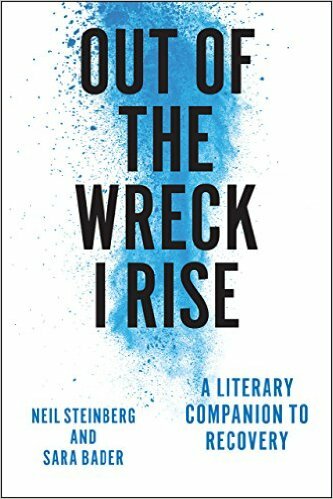 And maybe make a few bucks in the process, like Sidney Greenstreet always did with Bogie in "Casablanca"--"Carrying charges, my boy, carrying charges..."--buy low and sell higher and be a wheeler-dealer. It's in the blood,I guess. Years ago--very briefly--I scalped tickets near Wrigley...until the cuffs went on. SpongeBob: More than "nautical nonsense." A whole new meaning to "Watch on the Rhine"